This article was originally published in The Diplomat, 28th October 2016 under the title North Korea and the Global Fight Against Climate Change. Environmental engagement with North Korea might open up a window for engagement that has been slammed shut by fractious nuclear politics. Carefully nurtured cooperative relationships developed over time between international agencies, NGOs and the North Korean government hold promise as vehicles for confidence-building, giving the DPRK a stake in regional cooperation based on their own interests. The North Korean government would appear to have a compelling prima facie self-interest in participating in the global climate change mitigation and adaptation project centered on the UN Framework Convention on Climate Change (UNFCCC). Capacity-building incentives that feed into the leadership perpetuation and state survival imperatives of the North Korean government appear to drive North Korea’s interaction with the UNFCCC. Environmental vulnerabilities matter, because they could threaten the stability of the Kim government. This vulnerability gives North Korea a stake in advancing environmental cooperation based on its own self-interest, a dynamic that does not exist in relation to denuclearization politics. In 2016 the Democratic People’s Republic of Korea (DPRK) has conducted two nuclear weapons tests, highlighting the significant advancement of its nuclear weapons program as it makes an end run toward a fully deployable nuclear weapons capability and there appears little the international community can do to stop it. However, while Korean Peninsula nuclear politics remains an important strategic issue, the contours of the situation have remained relatively predictable for over two decades. Indeed the tiresome, ritualized repetition of the same old denuclearisation rhetoric across the international community only serves to highlight the absurdity of chasing that objective under the current circumstances. This is not to say that denuclearisation of the Korean Peninsula is not a laudable objective, but merely to acknowledge the unique strategic circumstances on the Korean Peninsula and reflect on the inability of sanctions measures in successive UN Security Council resolutions to compel North Korea along the denuclearisation pathway. In short, the isolation approach adopted since 2002 has not worked. If we examine North Korea from a systems perspective, factoring in the emergent effects of complex inter-relationships between different actors within and outside the DPRK, we see that the nuclear program is nested within inter-related economic, social and ecological change processes taking place at multiple levels, from local to global. Climate change is but one of these change processes. We see the structure of the DPRK economy evolving, along with the political and social relationships that flow from this structure. The emergence of Deng Xiaoping-style incremental economic reforms and the growth of an entrepreneurial moneyed class, though incremental, are changing the relationship between the North Korean people and their government, along with the dynamics of North Korea’s relations with neighbouring countries. A system-level analysis of North Korea appreciates the role of environmental vulnerability intersecting with these other change processes. As severe flooding events around Rason and beyond in 2015 and 2016 illustrate, the DPRK is highly vulnerable to natural disaster events. Such disasters are becoming increasingly frequent as a result of climate change. North Korea and Climate Change: Are They Serious? North Korea’s flirtation with state failure during the Arduous March period of the mid-1990s illustrates this relationship. This period’s energy shortages, food insecurity, vulnerability to natural disasters is pivotal to understanding the ongoing weakness of the DPRK economy. 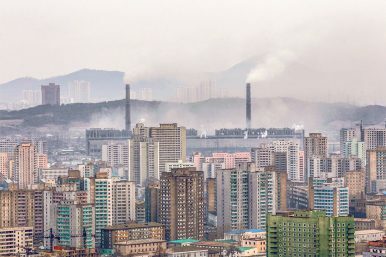 It therefore stands to reason that greenhouse gas abatement, capacity-building in both the agricultural and energy sectors, and exploration of new sources for foreign currency revenue could be logical components of the North Korean government’s plans to address these weakness and plug holes in the matrix of the economy. As early as August 2002, the DPRK’s Korean Central News Agency warned about the danger of ‘whimsical’ weather patterns and repeated natural disasters attributable to global warming. More recently, the DPRK government has released two detailed reports — its 2012 Environment and Climate Change Outlook and its Second National Communication to the UNFCCC in 2013 — that document North Korea’s particular vulnerabilities to climate change and environmental degradation. Outside observers say climate change impacts are likely to interact perversely with pre-existing fragilities in the political economy of the North Korean state. It should be noted that North Korea’s participation in UNFCCC Conference of Parties meetings has been sporadic and unobtrusive. Prior to COP21 in Paris it has only sent a minimal representation of mid- and lower-level diplomats to four Conference of Parties since 1995—COP9 in Milan, COP15 in Copenhagen, COP17 in Durban and COP20 in Lima—and when in attendance, its delegates have tabled no data or official statements to the proceedings. With the exception of Ambassador Ri Chol Hui at Copenhagen, none of the delegates representing the DPRK were of sufficient rank to signal a strong commitment to the negotiating process. That changed however at COP21 in Paris last December, where the DPRK sent their largest ever delegation to a conference of parties including Minister of Foreign Affairs Ri Su Yong and Ambassador-at-large Kim Yong Il, along with high ranking officials from the Ministry of Foreign Affairs, National Coordinating Committee for Environment (NCCE), and DPRK Embassy in France. North Korea has also engaged with the Clean Development Mechanism (CDM) under the Kyoto Protocol primarily as a vehicle for generating foreign currency income. However, the miniscule revenue potential of the DPRK’s suite of CDM projects in the uncertain terrain of international carbon markets do not make for a compelling cash cow in the short term. North Korea’s enlarged delegation at COP21 may indicate that they see growth potential in this area now that the Paris Agreement has given a clear signal in favor of accelerated development and inter-linkage of international carbon price mechanisms. North Korea is also using the UNFCCC as a vehicle for capacity-building projects. There is a strong congruence between the over-arching goals of environmental treaty regimes and the systemic consolidation needs of the North Korean government’s policies of military-first politics (Kangsŏngtaeguk) and simultaneous nuclear weapons and economic development (Byungjin Line). These projects are intended to increase agricultural output and build the resilience of the agricultural system to disaster events. There is also a strong probability that North Korea is free-riding on the UNFCCC as a vehicle for obtaining foreign assistance to upgrade its energy production and transmission infrastructure. Taking advantage of the numerous capacity-building opportunities within the treaty makes sense from a systemic consolidation perspective. This could enhance the government’s domestic legitimacy by providing tangible evidence that the government is responding to the needs of its citizens, while compliance with the treaty could also bolster its claim that it is a constructive international actor. The confluence of the transformative social forces and the convergence of interests between Pyongyang and international environmental treaties is creating a window of opportunity for the international community to influence the North Korean state, if external players are willing to adopt a more expansive view of security regional security beyond the narrow focus on nuclear diplomacy. Bolstering regime legitimacy has currency as an explanation for Pyongyang’s interest in the global climate change regime at a time when the North Korean government is trying to manage the transformative influence of emerging economic and social forces. It is attempting to attract foreign investment into its four special economic zones and 19 economic development zones, while also attempting to maintain control over a growing nouveau riche entrepreneurial class who have accrued wealth through the advancing marketisation of the North Korean economy. This provides a window of opportunity for the international community to influence the North Korean state — if external players are willing to adopt a more holistic view of security in relation to the DPRK. Proven deterrence postures are not compromised by meaningful environmental engagement. In comparison with conventional security and nuclear politics, environmental engagement with is relatively depoliticized. Carefully nurtured cooperative relationships have developed over time between UN agencies, NGOs and the North Korea government which are potential vehicles for enhanced confidence-building measures. Both the Lee and Park administrations made rhetorical commitments to further environmental cooperation with the DPRK. In addition, sophisticated South-North “green détente” proposals have emerged from sections of the policy community in Seoul. However, Park Geun Hye’s government has cooled on the idea because of fears that food and energy-related capacity-building assistance could bolster the North Korean military, rather than help ordinary North Koreans. Environmental engagement through bilateral initiatives, regional organisations and multilateral treaty regimes like the UNFCCC represents a promising pathway to achieving these goals. Beyond the UNFCCC, North Korea is involved in other environmental multilateral regimes and specific initiatives which give it a stake in regional stability. In addition to the UNFCCC, these include the UN Convention on Biological Diversity, UN Convention to Combat Desertification, the Basel, Stockholm and Rotterdam Conventions treaty complex that protect against environmental damage from hazardous chemicals and wastes, and the Vienna Convention for the Protection of the Ozone Layer. The Northeast Asian Subregional Program for Environmental Cooperation of the UN works on nature conservation projects in the DPRK, including the Rason Migratory Bird Reserve. Smaller scale bilateral initiatives such as South Korea-backed reforestation projects and proposals for the establishment of the DMZ as a “peace park” conservation zone could be further explored. An engagement opening in the environmental policy realm could have implications for the human rights strategy advocated by the UN Human Rights Council’s 2014 Commission of Inquiry report. The report is valuable as a systematic and comprehensive catalogue of evidence documenting human rights violations perpetrated by the DPRK government against North Korean citizens. Chief among its recommendations are that “the international community must accept its responsibility to protect the people” of North Korea through a “human rights up front” strategy, which would demand that UN agencies working in the DPRK limit assistance without demonstrable changes in human rights practice from the government in Pyongyang. While meritorious as a strategic intervention specific to the human rights issue domain, the human rights up front strategy could potentially compromise any future efforts at environmental engagement because it is predominantly the UN agencies working in the DPRK that are delivering the capacity-building assistance available through international environmental treaty regimes. This hypothetical example illustrates the conflict over engagement trajectories between advocates of humanitarian work addressing immediate survival needs of North Korean people versus advocates of a more punitive human rights campaign against the North Korean government. Proponents of engagement are often criticised for “appeasement” or the one of the more colourful Twittersphere colloquialisms, “dictator hugging.” The argument underpinning these pejoratives is that engagement initiatives prop up the Kim regime, help to fund (directly or indirectly) it’s nuclear and ballistic missile programs, and legitimises its human rights abuses. Aside from the uncomfortable observation that Western governments regularly “hug dictators” when it suits their interests, interacting with authoritarian regimes is difficult and often requires uncomfortable compromises with officials and institutions whose values they do not share. Difficult though it may be, leveraging dynamic processes of change in the DPRK entails getting one’s hands dirty for greater ends through up-close interaction. Let’s consider the alternatives. Isolation, economic squeeze and moral absolutism has not worked for the international community in its approach to the DPRK. Indeed these approaches only seem to confirm the caricatures of the West in the Kim regime’s anti-imperialist propaganda. The logical end-game of isolation is regime collapse or war, both of which are lose-lose outcomes for the region. Disdainful as the Kim regime may be, anyone with a genuine interest in the well-being of the North Korean people cannot seriously argue in favour of strategies that risk killing and displacing hundreds of thousands of North Koreans and plunging Northeast Asia into chaos. Isolation and righteous moral indignation is not a defensible policy strategy, if actual measurable change in the DPRK’s foreign policy behaviour and tangible improvements in the lives of North Korean citizens is the objective. Gradual improvements in governance, human rights and economic well-being for greater portions of the North Korean people, over longer-than-immediate time horizons, could be achieved by engagement initiatives that interact with the dynamic social change processes underway in the DPRK. Environmental engagement is a vehicle that could achieve all these goals simultaneously. Habib, B. (2015) ‘Social Convection and the Everyday Transformation of North Korea: A Review Essay‘. Asian Studies Review. 40(3): 445-453. Habib, B. (2015) ‘Climate Change, Security and Regime Formation in East Asia’, in Pacheco Pardo, R. and Reeves, J. (eds.). Non-Traditional Security in East Asia: A Regime Approach. London: Imperial College Press, pp. 49-72.